Today we have what to get the guy who has everything, sports gifts edition. I think these are great because guys need slippers too, but most slippers I have seem for men are majorly fuddy duddy looking. These have the coolness factor of NFL team logos and all the teams are available, as well. They look warm and comfy, yes, but not at all old fashioned or geeky. So if you are looking for a gift for the person in your life that lives and breathes team spirit, these may be for you. 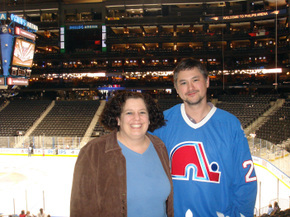 Jin and I got to go see the Atlanta Thrashers play the Colorado Avalanche on Tuesday night. Jin's mom babysat the kids and we went to the game at Phillips Arena. We made the usher take our picture. It had really bad red-eye and I did a bad job fixing it, but its better than nothing, right? We had great seats! Just kidding - we were just up at the glass watching the warmup before the game. Here is Adam Foote stretching. 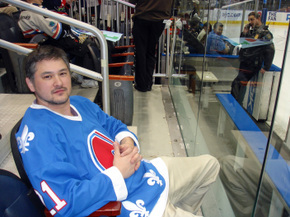 He gave a double-take and smiled at us when he saw Jin's Nordiques jersey. He's one of the few players that were with the team back then and wore that jersey. 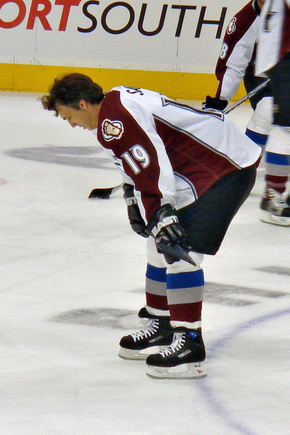 This is Joe Sakic during the warmup. Joe's lookin' kinda tired. 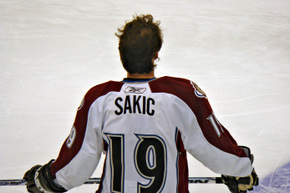 Joe Sakic from the back.